Liverpool City Region collective switch offers are now in! 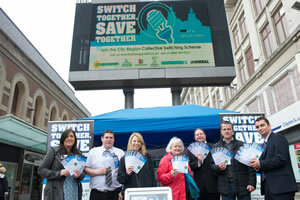 Over 4,500 residents have joined the Liverpool City Region Collective Switch to get a better deal on their energy bills. Offers are now in from energy suppliers and there’s something for everyone. Householders are invited to have a look at the offers and see how much they could save. The level of response enabled scheme switching partner, energyhelpline to negotiate several different deals to suit the different needs of the whole group. Offers were made by Scottish Power, Npower, The Co-operative Energy and Good Energy and include a variable tariff; a range of fixed tariffs with options to fix for one, two or three years; a green tariff; an offer for customers paying by quarterly billing, and an offer for customers with prepayment meters. Some of these are early bird offers which end on Friday 7th June. All other offers end on Friday 14th June. There’s still time to join the collective switch until the offers close on 14th June. You can see the offers as part of a full market comparison, and generate a personalised quotation to see how much you could save, by visiting www.LCRenergyswitch.co.uk. Alternatively, you can call energyhelpline on 0800 902 0415 or 01622 845 594 to speak to an expert energy advisor.